Our Malas, Pocket Malas, and Bracelets all feature genuine semi-precious stones, mindfully selected for their metaphysical powers to attract or overcome specific feelings, thoughts, or emotions. Please See below for the powerful stones used in our malas. Though it might sound like a form of turquoise, African Turquoise is its own unique stone. A teal, speckled form of jasper, African Turquoise offers quite different qualities and energies. Considered the stone of evolution, African Turquoise brings about great change and transformation within life. Its encouraging energy opens minds to the possibility of newness. This stone helps us to see the need for development and metamorphosis, and provides the balance and confidence necessary to further the process of self-development. It will renew your spirit, energy, and path in life. Carry it with you, and you will feel its reassurance as you meet new possibilities. African Turquoise resonates within the Third Eye, leading its bearer to greater wisdom. The stone awakens our spiritual bodies to their intended highest purpose, sharing knowledge of those long past to guide us on during periods of change and growth. It initiates the pathway to a clear, focused mind. Those who seek direction to their highest inner self will benefit from African Turquoise, as it is a crucial tool in the work of broadening and strengthening all bodies while we grow. African Turquoise is featured in our Aranyani Collection. Like the deep and ancient waters of the river for which it is named, Amazonite beckons in captivating shades of turquoise and green, promising to calm the spirit and soothe the soul. Embodying the legendary woman warriors it personifies, its powerful energy provides harmony and balance, tempering aggression and taming the irrational. Sometimes called the Stone of Courage or the Stone of Truth, Amazonite empowers one to search the self and unveil one's own integrity and truth, and move into alignment with those beliefs and values. From times of the earliest cultures in Mesopotamia, Egypt and India, Amazonite has been used as a powerful talisman of healing and prosperity. Amazonite, also called Amazon Jade, is a green to blue-green variety of Microcline, a Feldspar mineral that forms in short prismatic or tabular crystals or in masses. It ranges in hue from bright verdigris green to paler shades of turquoise, sometimes with white, yellow or grey portions, and can be translucent to opaque. Amazonite is a wonderful healer for the emotional body. It soothes trauma and calms the mind, alleviates worry and fear, and directs anger and irritability into a more positive action. It regulates aggression and urges the mind to seek emotional balance. Amazonite carries a spiritual energy of personal truth, magnifying our intentions and empowering us to manifest our dreams and desires. Amazonite is featured in our Sedna Collection. Aquamarine evokes the purity of crystalline waters, and the exhilaration and relaxation of the sea. It is calming, soothing, and cleansing, and inspires truth, trust and letting go. In ancient lore, Aquamarine was believed to be the treasure of mermaids, and was used by sailors as a talisman of good luck, fearlessness and protection. It was also considered a stone of eternal youth and happiness. Today it protects all who travel by, over, or near water, and opens the channels of clear and heartfelt communication. The name Aquamarine comes from the Latin aqua marinus, meaning "water of the sea," and refers to its sparkling ocean-like color. The pale blue, transparent crystal is a member of the Beryl family. Aquamarine emits a gentle and compassionate energy, promoting moderation and responsibility for ones' actions. A powerful stone for cleansing the emotional body and opening communication, it helps balance excessive anger or fear, and clears past emotional, physical or verbal abuse. Aquamarine is a stone of empowerment, for men and women alike, aiding in the realization that not all power comes from force. There is also power in aligning with the yielding, resilient vitality of life, and in promoting truthful and compassionate communication. Aquamarine is featured in our Aether Collection. Sandalwood is a sacred wood with a lovely aromatic scent. Grown in Asia and East India, Sandalwood was originally used at funeral ceremonies, its scent believed to the soul into the next life. The aroma — which retains its fragrance for decades — comes from the wood itself rather than the leaves or flowers. The warm soothing scent of sandalwood helps the mind to unwind and helps open the heart to love. In ancient Buddhist tradition, Sandalwood has been celebrated as the perfect meditation tool for thousands of years. It is widely believed that the sandalwood scent can stimulate sensuality, grant a sense of awareness, invoke tranquility, awaken the divine thoughts within and promote profound relaxation. Sandalwood is believed to enhance trust and self-identity. In the Ayurvedic healing tradition, it promotes energy and enthusiasm; increasing a person's self-esteem and zest for life. You can use the healing aroma of sandalwood to promote feelings of peace and serenity and also to ease various ailments of the digestive system. It subdues aggression and irritability, promotes compassion and openness and enhances meditation. Aromatic Sandalwood is featured in our Aranyani and Sedna Collections. Azurite, named for its deep "azure blue" color, is a copper carbonate mineral found in the upper oxidized portions of copper ore. Azurite is often found in nature mixed with Malachite, another copper carbonate mineral, this one with a bright green color. Malachite personifies the deep healing green of nature and represents the innate beauty of flowers, trees, roots and plants. Together, in polished form, they resemble Mother Earth and carry not only their individual properties, but a powerful blend of healing energies. Azurite-Malachite is an exceptional conductor of energy, bringing a grounded, more integrated process in healing physical dis-ease. The blue ray penetrates and moves energy, calming stress levels within the system while the green ray facilitates a deep healing force. It may also be used to activate the Third Eye in cleansing the subconscious of emotionally charged thoughts or negative feelings, and restoring a higher and clearer mental state. It assists in dissolving egocentric traits, dispelling conceit, arrogance and vanity, and instills a willingness toward flexibility and individuality based on a universal connection to “All.” Azurite-Malachite’s combination of energies is highly conducive to meditation by allowing one to go deep within the self, without fear, in order to be sustained, absolved, and reborn into the light, completely aware of the genesis at all times. Aromatic Sandalwood is featured in our Aranyani Collection. Sometimes called "Gold of the Sea," Amber is one of the world’s oldest and most coveted treasures, intrinsically formed by light and life, preserved by time and washed upon the shores after millions of years. Known as a talisman of beauty, protection and renewal, Amber is neither a crystal nor mineral, but rather a biological product of nature, a protective resin that once oozed from living trees in dense, prehistoric forests. After millions of years of fossilization in the depths of the sea (Most Amber is 30 to 90 million years old! ), Amber washes upon the shores in the Baltic region. Highly prized in the metaphysical world for the strong healing Life Force it carries, Amber is excellent at alleviating stress, depression and anxiety, and increasing energy levels and overall vitality. Amber helps remove the roadblocks we place in our own way, as well as deflecting the negative energies of others, and is a great tool for turning our dreams into reality. Its vibration of life force brings warmth to the inner being and imparts beauty and tenderness, and is seen as a good luck talisman for increasing one's natural radiance and attracting lasting love. Amber is exceptional at discharging negative moods, relieving anxiety, and deflecting energy from others. It warms to the touch, and emits a positive, uplifting current of energy. It is a natural purifier, esteemed for its ability to extract pain and dis-ease from the physical body, as well as the mind and spirit, by absorbing negative or stagnant energies and transforming them into clear, positive energy. Baltic Amber is featured in our Zeme Collection. A powerful protection stone, Black Onyx absorbs and transforms negative energy, and helps to prevent the drain of personal energy. It aids the development of emotional and physical strength and stamina, especially when support is needed during times of stress, confusion or grief. Black Onyx fosters wise decision-making. Use it to encourage happiness and good fortune. Black Onyx is a strength-giving stone and can provide support for self-discipline issues. Because it helps to hold physical memories, Black Onyx can be useful in healing old wounds or past life issues. It is wonderful for meditation and dreaming. When using it for either of these purposes, it is recommended to use a secondary grounding stone in combination with the Onyx. Black Onyx helps one to become master of their own future. Black Onyx is featured in our Nyx and Ra Collections. Blue Aventurine combines the elements of Wind and Water in a gentle stone that resonates from the mind to the heart, working calmly, rationally, and steadily. It enhances the masculine energy in both males and females, and is a stone of self-discipline and inner strength, assisting one in making clear decisions and sticking by them. Aventurine is a variety of Quartz characterized by bright inclusions of Mica or other minerals that give a shimmering or glistening effect to the stone. As a “take charge” and “stick to it” crystal, Blue Aventurine can be highly beneficial in overcoming bad habits, such as smoking, overeating, and substance-abuse, or in dissolving negative traits, such as selfishness and passive aggression. Physically, Blue Aventurine ameliorates pain and chronic stiffness, and may help in lessening muscle twitches, spasms and facial tics. It assists in calming hyperactivity, and enhances mental focus and concentration. This crystal is beneficial in overcoming insomnia, lessens migraines and headaches, and aids the eyesight. It has a cooling effect and reduces fever; it is believed to relieve sinus problems, allergies, colds, coughs and congestion. 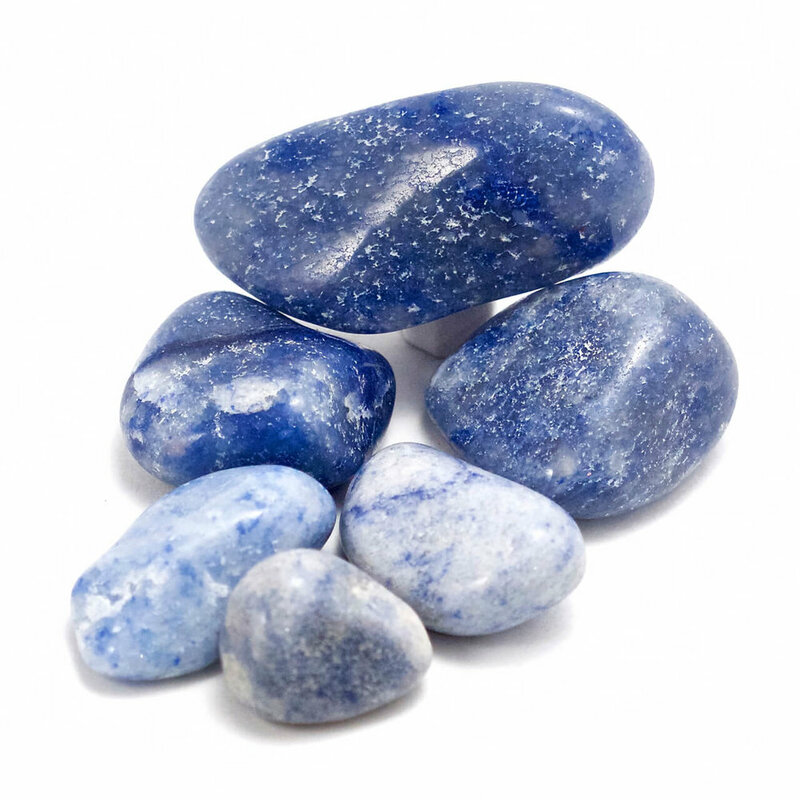 Blue Aventurine encourages adventure at any age and is a stone of travel, helping to make desired travel plans happen and for protection against travel interruption. Blue Aventurine is featured in our Aether Collection. In traditions of both the spiritual and metaphysical realm, Brass is relied upon to inspire good and bring out the inner truth. Comprised of Copper and Zinc, Brass has healing properties that boost the immune system and inspire courage. Brass has the ability to adapt to your own body chemistry with repeated use, revealing your own personal energy signature. Simply wearing an old tarnished piece of brass jewelry will cause the tarnish to magically vanish. Brass dates back to the prehistoric period and can be referenced in almost every part of the world. But it really rose to prevalence during the height of the Roman Empire, primarily pressed into currency during the 1st century. After the decline of the Roman Empire, brass production decreased significantly, as well as through the medieval period. Despite its continued popularity in Eastern Europe, production declined in the West. But with the development of new production techniques following the medieval period, brass production increased again, and was produced all across Europe on a large scale. Due to the large presence of copper, Brass is especially good for healing skeletal problems, and aids in purifying and eliminating toxins from the body. Brass is featured in our Zeme Collection. Carnelian is an orange-colored variety of Chalcedony, a mineral of the Quartz family. The ancient Egyptians called Carnelian "the setting sun." Carnelian is said to attract prosperity, new resources and good luck. It is a talisman for success, and is said to lend the courage needed to help overcome difficulties. Carnelian is a stabilizing crystal, perfect for anchoring in the present. Its high energy helps restore lost vitality and motivation, and stimulates creativity for new pursuits. It improves concentration and protects against envy, rage, and resentment in yourself and others, encouraging instead a life of love. Carnelian is featured in our Ra Collection. Copal is a resinous substance in an intermediate stage of polymerization and hardening between more viscous resins and Amber. Copal is tree resin that has not gone through the fossilization process that makes amber what it is today. Experts can't agree about how old copal has to be before it becomes amber (it depends on geological, botanical and chemical transformations), but the general consensus seems to be that copal is usually less than 100,000 years old, but sometimes can be as young as 1000 years old. By comparison, the oldest amber pieces date to the Upper Carboniferous period, approximately 320 million years ago. Copal ranges in color from pale yellow, orange, red and white. Copal has a long, aromatic history. It has been valued since Neolithic time for its beauty when used in ornamentation, but even more so for its use in religious rites. The name "copal" comes from the Mesoamerican Nahuatl word "copalli" meaning "incense." A powerful yet gentle healer and cleanser, Copal draws out and transmutes negative energy of all kinds on all levels. Copal aids in physical self-healing, emotional healing of depression, and environmental clearing. Highly protective, Copal also aids in the manifestation of ideas to reality. The life force trapped within Copal promotes fertility, and its protective and environmental clearing properties make it a good stone to use in a healing room or in preparation for childbirth. Copal is featured in our Pele Collection. Fire Agate, known as the spiritual flame of absolute perfection, is a variety of Chalcedony, a mineral of the Quartz family. Historically, Fire Agate was used in alchemy because it was believed to contain the essence of fire. It is a stone of integrity, encouraging high standards of behavior in self and others, and promotes passion in love and in life. Fire Agate provides a steady, vibrant energy that stimulates a zest for living. It is a stone of creativity and expression, and is particularly helpful in overcoming artistic blocks of all kinds. Agate promotes inner stability, composure, and maturity, while its warm protective properties encourage security and self-confidence. Fire Agate is featured in our Pele Collection. Lore of the Inuit peoples claim Labradorite fell from the frozen fire of the Aurora Borealis, an ordinary stone that transforms to the extraordinary, shimmering in a mystical light that separates the waking world from unseen realms. Labradorite is also the most powerful protector of the mineral kingdom, creating a shielding force throughout the aura and strengthening natural energies from within. It protects against the negativity and misfortunes of this world, and provides safe exploration into alternate levels of consciousness and in facilitating visionary experiences from the past or the future. Labradorite is a member of the Feldspar family and is treasured for its remarkable play of color, known as labradorescence. The stone, usually gray-green, dark gray, black or grayish-white, is composed in aggregate layers that refract light as iridescent flashes of peacock blue, gold, pale green, or coppery red. The predominant blue varies within the light, displaying hues from deepest blue to various shades of pale, almost blue-green. Labradorite tempers the negative side of our personality, the traits and actions that rob our energy and may produce depression or shame. Labradorite calms an overactive mind and energizes the imagination, bringing in new ideas. It is a wonderful tool for returning joy and spontaneity back to one's life. It helps eliminate the emotional drain of daily routine or being weighed down by responsibility, and awakens a sense of adventure and change. Eskimo legend is that in a fit of passion over lost love a great warrior threw his sword into a stone wall which casued the stone to shatter. This released the Northern Lights and the stone turned into Labradorite. Labradorite is featured in our Mujaji and Nyx Collections. Lapis Lazuli is one of the most sought after stones, and has been in use since man's history began. Its deep, celestial blue remains the symbol of royalty and honor, gods and power, spirit and vision, a universal symbol of wisdom and truth. Its name comes from the Latin lapis, "stone," and the Persian lazhuward, "blue." It is a rock formed by multiple minerals, mostly Lazurite, Sodalite, Calcite and Pyrite, and is a rich medium to royal blue with gold flecks (pyrites). Lapis Lazuli was among the most highly prized tributes paid in ancient Egypt, obtained from the oldest mines in the world, worked from around 4000 B.C. and still in use today. Referenced in the Old Testament as sapphire (unknown in that part of the ancient world), Lapis Lazuli is most likely the fifth stone in the original breastplate of the High Priest, as well as those of later times. In the dry, barren land of the Egyptians, this deep cobalt blue color was a spiritual contrast to their arid desert hues. The gold flecks were like stars in their night-time sky and by meditating on these colors they felt supernatural forces would transform their lives. In ancient Persia and pre-Columbian America, Lapis Lazuli was a symbol of the starry night, and a favorite stone of the Islamic Orient for protection from the evil eye. Buddhists recommended Lapis as a stone to bring inner peace and freedom from negative thought. Lapis Lazuli relieves general pain and inflammations, and is especially effective against migraine headaches. It aids the nervous system and brain disorders, and is believed to help with attention-deficit, autism and Asperger's syndrome. As a protection stone, Lapis Lazuli recognizes psychic attack and blocks it, returning the energy back to its source. It quickly releases stress, allowing for peace and serenity. Lapis Lazuli is featured in our Nyx Collection. Basalt is a rock formed from magma erupting from a volcano. Since basalt is formed from molten lava, it originates from rock that was heated to the point of liquifying, you can only imagine the strength contained in this stone. Basalt is a stone of strength and courage, it provides stability in times of change. It often helps to dissipate anger and provide guidance and understanding. Because Lava Stone comes from volcanic origin, the nooks and crannies make each stone completely unique. Because of its porous nature, Lava Stone can also be infused with oils for further healing. Lava Stone is featured in our Pele and Ra collections. As ancient as the moon itself, Moonstone holds a powerful mystery locked beneath its pearly veil. Since the earliest times, Moonstone has been used in amulets of protection for travelers, as a gift of lovers for passion, a channel for prophecy, and a path to wisdom. Like the cyclical cadence of the moon itself, Moonstone calms and encourages us, teaching us the natural rhythms of life. Sometimes known as the Traveler's Stone for the protection it affords, especially at night, Moonstone is named for its moon-like sheen. It is a Feldspar mineral exhibiting a soft, watery opaqueness and a silvery-white reflection. Rainbow Moonstone acts as a prism, displaying beautiful flashes of color with different angles of light, and diffusing energy throughout the aura. It provides psychic protection, deflecting negativity and clearing the mind and senses, and aids in lucid dreaming and calm sleep. Moonstone bestows a depth of feeling, a gentleness within the self that brings happiness to the environment in which it resides. Associated with the feminine, it enhances the intuitive side of the mind, opening the mind to hoping and wishing, inspiration and impulse, serendipity and synchronicity. It brings flashes of insight, keeping one from negatively banishing possibilities. Aligned with the Goddess, Rainbow Moonstones connects with the energies and spirits of Nature. Sodalite is featured in our Aether Collection. One of the most ancient stone used by man, the first glass used was natural obsidian, volcanic glass, used to make arrowheads, knives, jewelry, etc. Objects created of manmade glass are reported to have been found from as early as 4,500 BC in Mesopotamia and 3,000 BC in ancient Egypt. Glass is a melding of all four of the traditional elements, because through fire and air the silica earth element is made molten and transmuted into a liquid only to return to its earthly state as a solid. It takes years for the ocean to do its work on a piece of discarded glass. Each coveted smoothed and weathered piece of sea glass was at one time a piece of discarded “junk.” The discarded glass thrown away long ago may have been from a jar or bottle, but sooner or later, its purpose no longer needed, it ends up on the ocean floor. A piece of sea glass is polished smooth on its journey from junk to jewel. This journey for the glass can be harsh at times while the glass is being churned over and over by the pressures of water and sand. Water and sand work on sea glass as pressure and fire worked for the alchemists in the transformation of metals. Similar to how the unconscious works on the personality, the sea works on transforming discarded sea glass into smoothed, rounded, and colorful gems. Each discovered piece of sea glass is entirely unique just like the uniqueness of each personality and their individuation process. Metaphysically, glass represents and carries the energies of transformation, merging of elements, rebirth, focus and communication. Sea Glass is featured in our Ægir Collection. Sea Sediment Jasper, also sometimes referred to as Impression Jasper, or Ocean Jasper, is rare Orbicular Jasper collected from the remote shores of northwestern Madagascar and can only be mined at low tide. It is sometimes referred to as The Atlantis Stone. It caries a gentle nurturing energy that, when used regularly, assists in developing self-love and empathy for others. Known as the "Supreme Nurturer," Jasper is a stone of grounding and stability, providing comfort and security, strength and healing. Historically, Jasper is traceable to all ancient peoples and civilizations. Worn by shamans, priests and kings, it was considered sacred and a powerful protection stone, for both the physical world and in the spiritual realm. Its presence balances the aura to a level of wholeness and peace, and acts as a reminder that one is not here on the physical plane simply for oneself, but to bring joy and substance to others. Sea Sediment Jasper is featured in our Ægir Collection. Every natural substance has a unique vibration that creates an energy field, and metal is no exception. Throughout the world Silver is identified with the lunar manifestations of the Great Mother, the eternal goddess. Like the moon and water, Silver acts as a "mirror to the soul", allowing one to see deep within the self without judgment, bringing people calm and balance. Silver is used to 'draw down the moon' during lunar ceremonies, giving the wearer use of the moons energy and protecting them from negativity. Silver's connection to the spiritual life is seen in many traditional cultures where people live in union and carry deep respect for the earth. It is believed that wearing it brings one more harmony with the vibrations and flow of the universe. Silver's properties are strongest during the new and full moon. As Silver relates to the moon, so does it relate to the yin or feminine energies, and can help those who are too aggressive to bring peace into their awareness. As such, Silver also helps one to get in touch with their own emotions and intuition, by allowing the acknowledgment of one's inner voice instead of repressing it. It is used to conjure patience and perseverance to the wearer, and it is used extensively with gemstones due to the fact that the metal attracts and retains the qualities emitted by the stones. The metal is reflective, and as the moon reflects the light of the sun, so does silver reflect the energy of its wearer.In Norse mythology, the name Ægir translates to "ocean." Ægir and his wife Ran are seen as the animating powers of the ocean and it's various qualities. Ægir is often portrayed as a gracious host to the gods, and personifies the more benevolent aspects of the sea, while Ran seems to correspond to its more sinister aspects, usually mentioned in the context of growing unfortunate seafarers and dragging them down to the depths of the sea. Together the couple has nine daughters, often interpreted as being spirits of the waves. Silver is featured in our Mujaji Collection. The name sodalite comes from the Greek words soda and lithos, which means salt stone, as the stone contains a lot of salt. Sodalite was discovered in Canada in 1891 during a visit of the Royal family, which earned it the nickname ‘Princess Blue’. Throughout history it was believed that sodalite improved creativity, leading to a high use among writers and artists, earning it the nickname of the "poet's stone." The natural negativity-filtering, communication-enhancing sodalite properties are very beneficial to writers, in keeping with sodalite meaning. Sodalite mineral stones filter out negative energy and encourage a positive thought process and enhanced communication, both of which are vital to writers. Minimizing the negative facilitates a more positive view of others, helping to reveal the brighter side of an issue or person, and enhancing the ability to give someone the benefit of the doubt, so to speak. Physically, Sodalite can ease anxiety and panic attacks, mental confusion, and fear/phobias. Use Sodalite to strengthen the immune system, ease insomnia and balance metabolism. Sodalite is featured in our Aether Collection. Turquoise is perhaps the oldest stone in man’s history, a talisman of kings, shamans, and warriors alike. It is a strong and opaque stone of protection, prized across all cultures for thousands of years as a symbol of wisdom, nobility and the power of immortality. Turquoise was considered sacred in its adornment and was used to bring power, luck, and protection, and to encourage us to honor ourselves as a creation and a tool of the Divine. A strengthening stone, it is good for overcoming exhaustion, depression, or panic attacks, providing solace for the spirit and well-being for the body. Turquoise benefits one's overall mood and emotion by balancing and inducing a sense of serenity and peace, while purifying and dispelling negative energy. It promotes self-realization, aids in creative problem-solving, helps stabilize mood swings, and dissolves a martyred attitude of self-sabotage. Spiritually, Turquoise heals and cleanses both the spiritual energy centers and the physical body. It acts to induce wisdom and understanding, and to enhance trust, kindness, and the recognition of beauty. Turquoise helps us moderate aggressiveness and deal with rage, bringing us back to our center, tempering excesses, neutralizing extremes, and relieving stress. Turquoise is a fresh, welcome energy that moves us to serenity as new growth and life emerges, bringing hope, discovery and balance. Turquoise is featured in our Sedna and Zeme Collections.